[ Solved ] How to make missile / projectile come out from weapon left / right at the same time? Hello sc2mapster how are you? I'd like to ask how to make missile / projectile come out from weapon left / right at the same time? I have a custom weapon that shot acid and want to give it to firebats / marauders, but when they fire the weapon only come out from one weapon left. You would need a Create Persistent effect that uses two Launch Missile effects at once and use a Pattern type Attach Method for the Action actor. Do you have a tutorial I could follow? Look at the marauder unit. Marauder unit actor or marauder weapon actor? If i know what i am supposed to look and what i am looking at, or where to look and how it look like i wouldn't have ask. Look at the marauder Action type actor. The Combat: Launch Attachment Query - Methods field is what determines the cycling of launch points. To get it to shoot missiles from both at once requires you to use two Launch Missile effects at once using either a Set Effect or a Create Persistent effect on your weapon. Perhaps if there are screenshots. https://imgur.com/n2U6I2v Here's an example. Just modify the offset to the place you want it to be. I wasnt meaning effect to add left and right. I meant to add a missile type actor and set events, host and host:attachment site. Or are you asking what effects to use for the attack? If you want to have a missile based weapon, you'll need a 'Launch Missile' and a 'Damage' effect. You have to set the 'weapon:effect' to the launch missile you made then go to launch missile effect and set the 'Impact effect' to the damage effect you created. I spent nearly 2 hours in the editor, but I was no where near the screenshot you showed me. This isn't working, not like this. 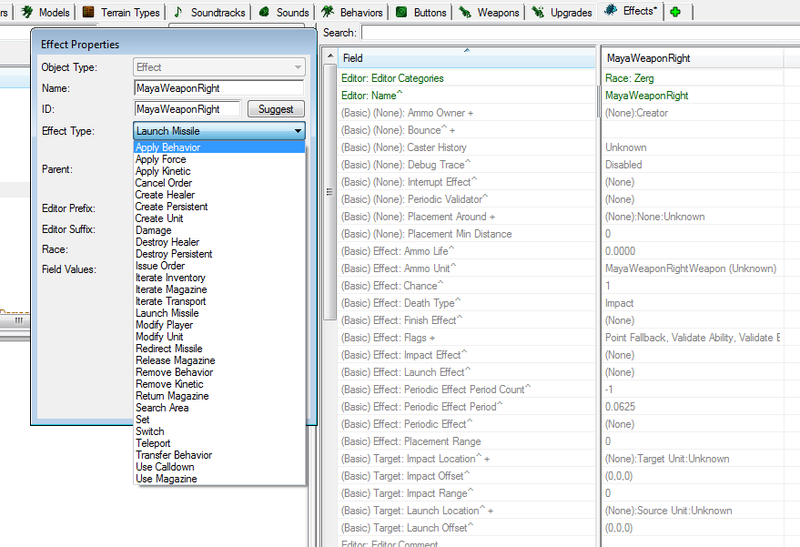 I will take screenshots of the missile actor(s) I created and perhaps you could point out which is which. I'll be home 4 hours later. I will then send you some screenshots and tell specifically. But maybe I could answer some question untill then. That'd be great. I gladly wait for you. Still say launching two missile simultaneously is the best solution. These are all you have to do. 2. Go to the actor data type (Or right click actor of the unit you selected and click View Linked Actors) and you have to find the (Unit name) Attack actor. 3. Duplicate the Attack actor(It's an Action type actor) and set the name as you want. In my case I set the original Attack actor's name to 'left' and the duplicated to 'right'. 4. Create two actors for the Launch Offsets. The actor type is Site Operation (Local Offset). It could be confusing but just to explain again just add a effect named (Unit name) Set with the type of Set and at the Effect: Effects field you can add multiple effects. Add two Launch Missiles effect. One is the original and the other one is the duplicated. There will be a screenshot at the end. The red ones are what I changed. If it does not work or seems weird, check the duplicated attack actor's Art:Missile field is same as the original attack actor's. Of course the damage is dealt twice so you'll need to set the Damage to half and set Display Attack Count field to 2 under the weapon. Ask me if you don't get it.